Let me just preface this post by saying that I had a great day! I had nearly an entire, uninterrupted day to do something I have wanted to do for months – build some fern tables! Ever since I first saw one – or more so, three – at Joy Creek earlier this spring, I have been hoarding plants suitable for such a thing. Les mots du temps every time I saw something I liked, have been ” Oooh – I can put that in a fern table!” Well, the months rolled by, and my collection grew – very much at the expense of walkable space in my little garden. 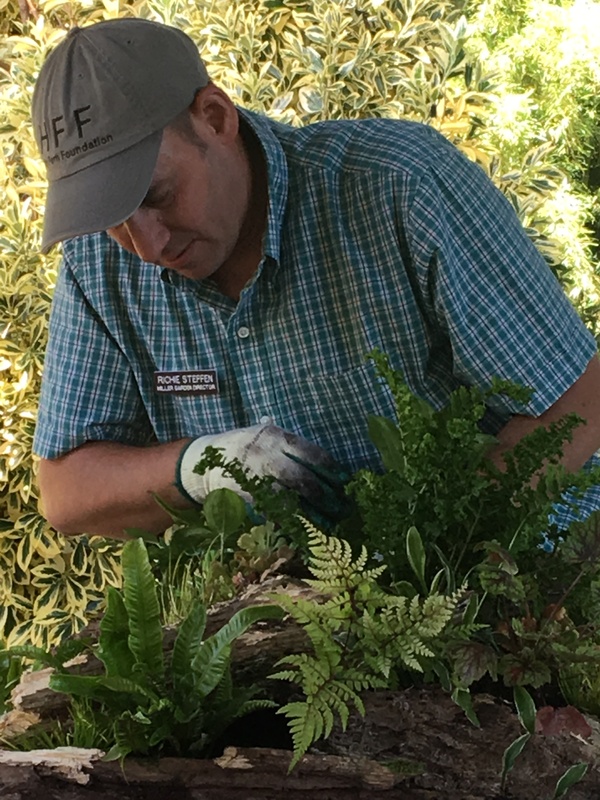 I never seemed to have time to actually spend productive time out there (other than watering, to keep the contents of all those little pots alive – no less create fern tables. This first Saturday of October, 2017, will go down in history as the day Anna actually got to play in her own yard for a change. Oh, the bliss!!! 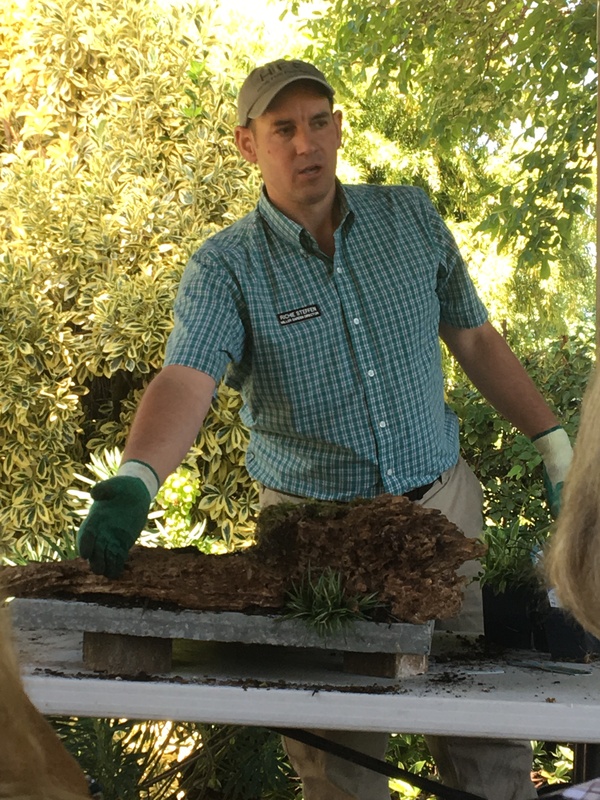 But, let’s backtrack… On July 2nd, Richie Steffen (Director/Curator at the Elizabeth C. Miller Botanical Garden and the guy that made the fern tables at Joy Creek, came down to teach a workshop on how to make them. He began his own fern table-building obsession after reading an excellent book called Gardening on Pavement, Tables, and Hard Surfaces, by George Schenk. So, are you ready? Let’s go! 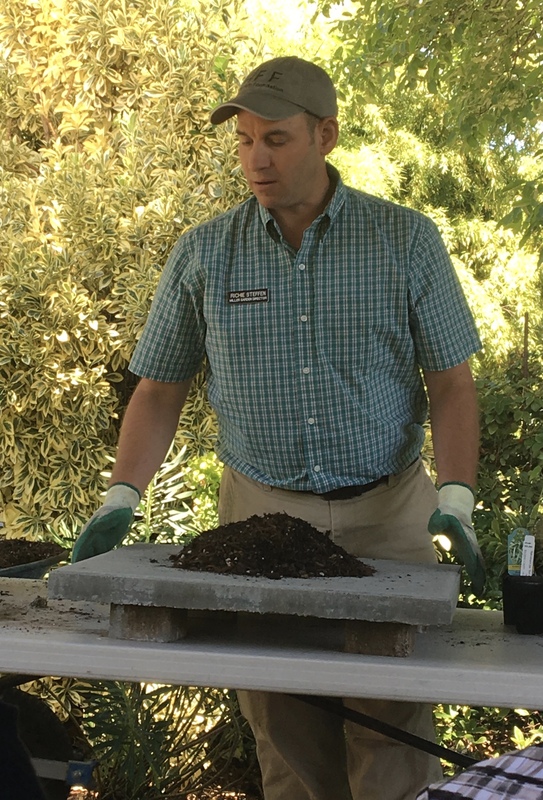 Start by piling a bunch of soil on top of your surface. Here, he is using a 2′ square concrete paver, but any flat surface will do. He told us he recently converted an old drill press to a fern table. In other words, your only limitation is your own imagination. As for the soil, he recommends a well-draining mix of bark, compost, and gravel. Don’t worry about drainage holes – you won’t need them. Next time you go hiking, be on the lookout for cool pieces of wood you can use. Once you have piled on the soil, it’s time to add the structure of your table. 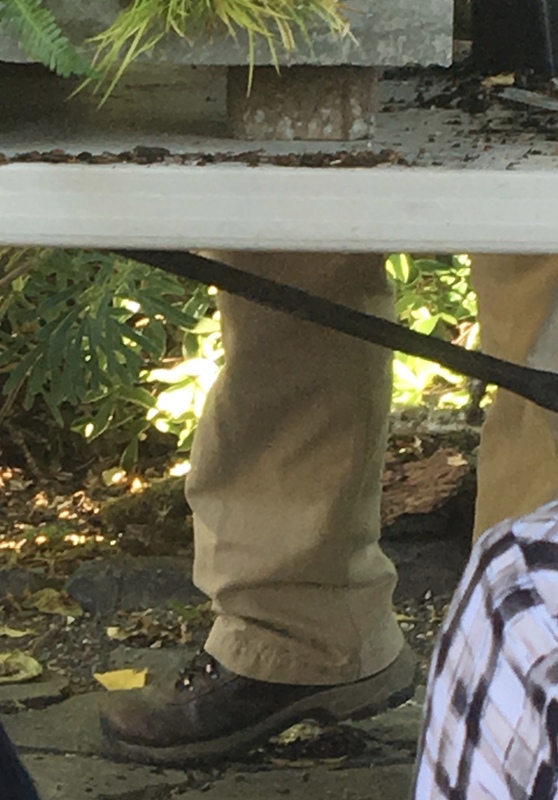 Richie used a big, decomposing, worm-eaten slab, reminiscent of a leg of lamb, as the main component of this table. He specifically cautioned against using drift wood, as it would mar the forest-y look – which made me laugh! 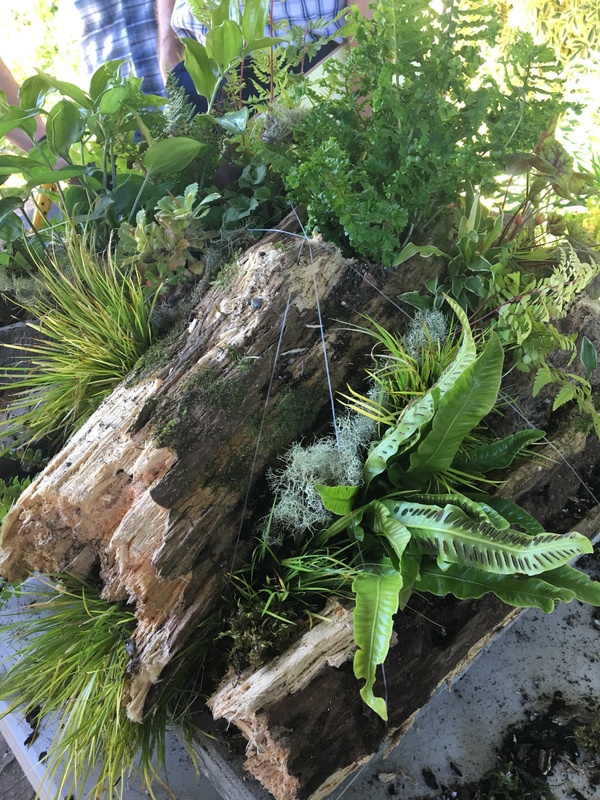 I had long ago decided that one of my tables would be a beachy variety with – maybe not so many ferns – but instead using things like Armerias, grasses, and maybe a succulent or two. Okay, I might put a Cheilanthes or two in there – for good measure. And, sorry Richie – I am SO going to use driftwood! I think that would be perfect! Now, it’s time for plants! Tuck them in wherever you have little pockets, be they on the vertical or the horizontal, and hold them in place with pieces of wood, or rocks – and of course – more soil. Some of those spaces can be a bit tight, and we all gasped when he tossed a little 4″ Mondo grass on the ground, and flattened it with his boot. My shutter missed the actual demonstration, but you get the idea. In its pancaked form, it fit its allotted space much better than the cubical form of its original root ball did. Apparently, the plants don’t mind so much, so no reason to be timid. The same goes with plants. Just because it’s called a fern table, doesn’t mean you have to use exclusively ferns. 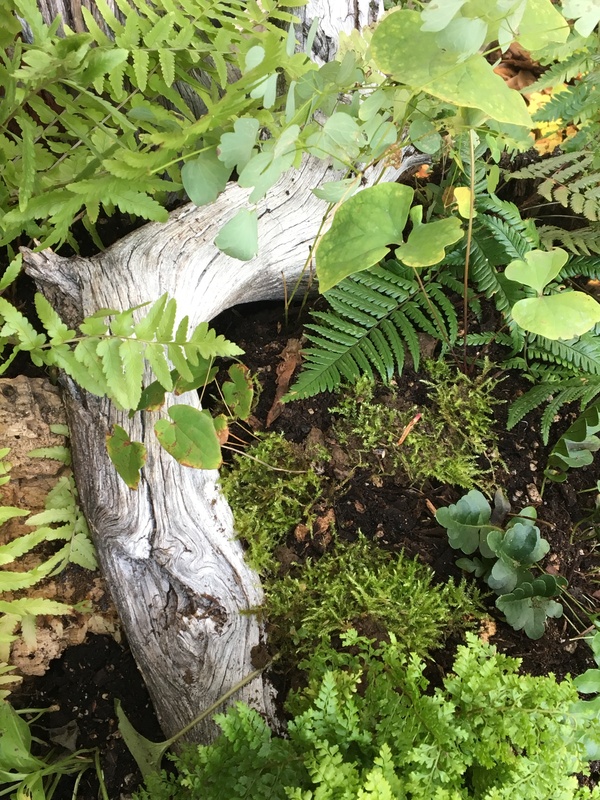 Granted – ferns are fabulously varied, but any compatible and complementary shade plant will do; Asarum, Saxifraga, Disporum, miniature Hostas, Heuchera, Alchemilla, Ophiophogon, Dodecatheon, Hepatica, Chiastophyllum…. and so on. The list is l-o-n-g. 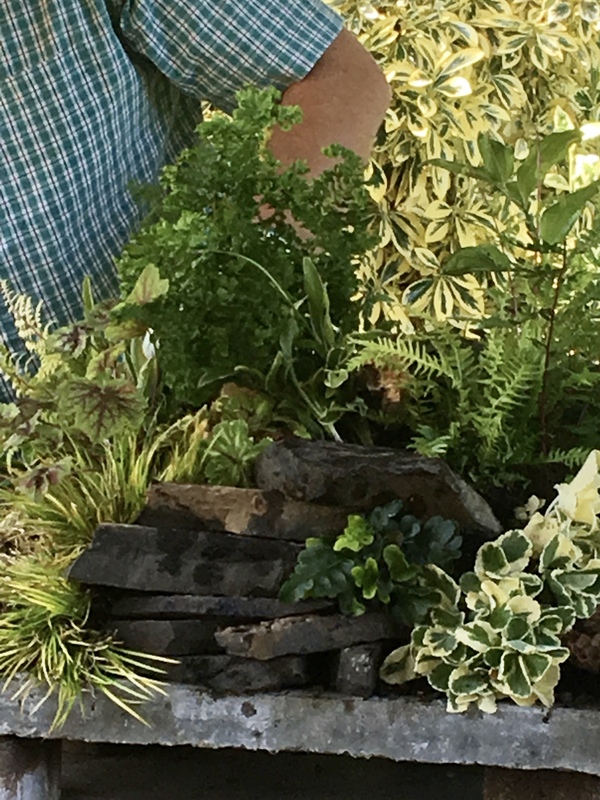 Here, the soil and the plants are held in place with layers of slate. Here are some shots of the final product. Not knowing how this piece will eventually be viewed, this table was made to be visually intriguing regardless of from which side it is viewed. If you wonder about the fishing wire – no, it is not a requirement. The only reason it is included here, is that this table needed to be moved once the workshop was concluded. 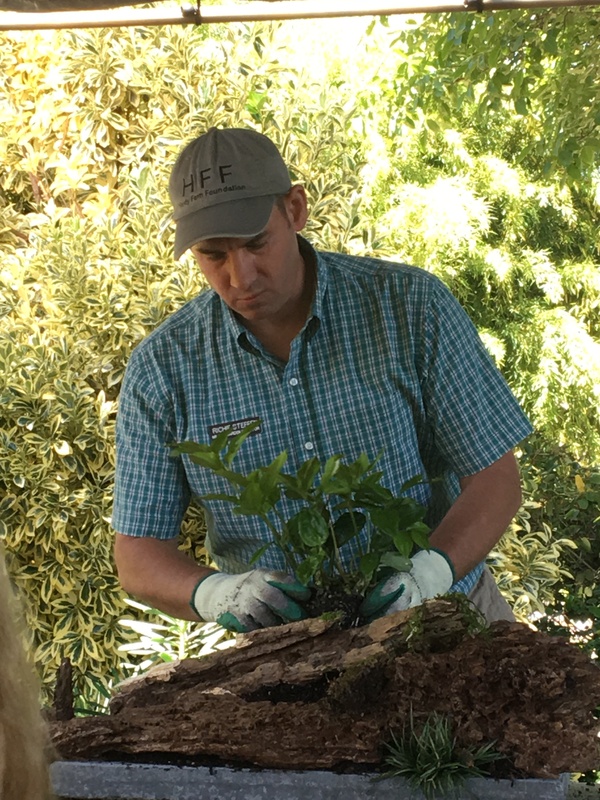 At the very end, Richie added a stick with some lichen, as a last little detail. 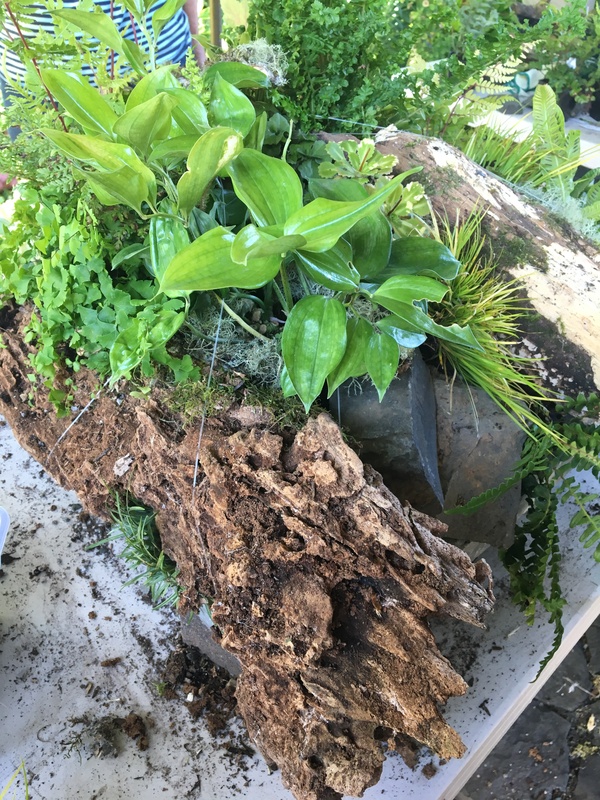 Soon enough the logs and the soil will be covered in moss, making the entire arrangement look like someone cut a little sample out of an ancient forest floor, and presented it. It truly is a lovely little vignette! Most importantly – have fun, and play with shapes, foliage, and color until you’re happy. I completely lost myself in the fun of creation today – although given the rough shape some of my plants were in, my fern tables don’t look half as good as Richie’s. At least not yet. Some of the things I put in mine, was nothing more than a tangle of roots at this point, having barely survived a dry summer in a little nursery pot. Fingers crossed there is still life in them, and that they will surprise me by emerging next spring! The table I made today was built in situ (highly recommended – these things are HEAVY!!!) with one edge against a wall, so the interest is focused on the other three sides. 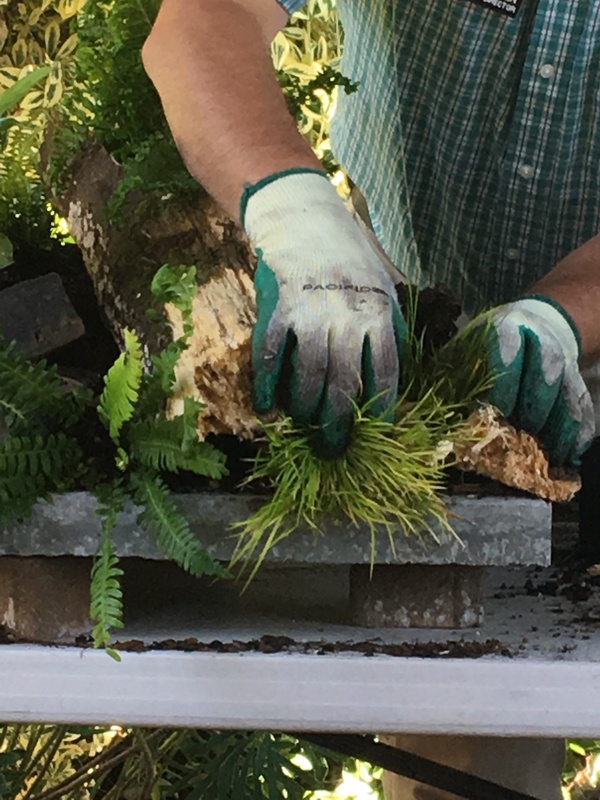 In this aspect, building fern tables is very much like planting pots – their ultimate location dictates their composition. Besides ferns, the plants (barely) seen in this photo are Epimedium, Asarum europaeum, a miniature Hosta, a small Thalictrum, and Jeffersonia diphylla. I also scraped off some moss from another spot in the garden, and added it. Hopefully it will take off soon! The one thing I didn’t expect to learn from doing this, was what a great way this is to use up plants. I bet I used at least 15-20 plants for each table I made. You can already see the difference in the garden, but once I get two more fern tables done tomorrow, this little exercise will have had a big positive impact in terms of cleaning up my garden clutter. And, for small gardens like mine, fern tables are great, because the plants used in them often don’t reach the size they would have reached, if planted in the ground. Plus, you are also building up – effectively layering vertically. So, from the point of view of a hopeless cramscaper – this means I can have MORE plants! Wo-hoo! EDIT: Also – for more inspiration, check out my friend Loree’s report on the workshop, as well as the embedded link of the one she made before the class. She recalled a few tips that I missed to mention , and came up with a much more interesting base than the concrete blocks I used. I have to say that using metal conduit like she did, gives the tables a much less heavy-handed appearance. Absolutely lovely! 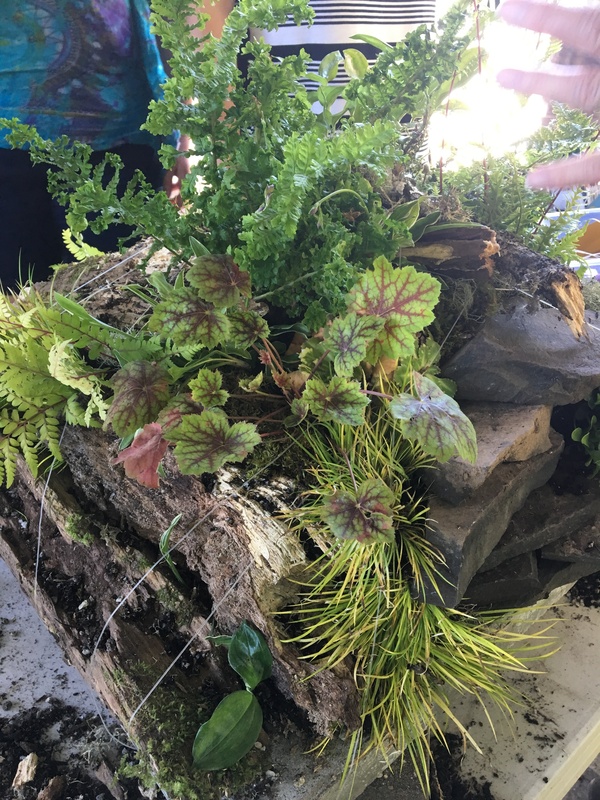 This entry was posted in Cool plants, Discoveries, Just for fun, Miscellaneous and tagged cramscaping, creative fun, de-clutterize your garden, fern tables, Ferns, hard surface gardening, Joy Creek, Richie Steffen, shade perennials, workshop. Bookmark the permalink. Haha – this may sound crazy, but this past summer, I indeed borderlined on too many… These fern tables are ingenious in dealing with the ensuing clutter! Gardening on Pavement, Tables, and Hard Surfaces, by George Schenk has inspired me for years. Our garden has so much pavement that i intend to cover with plants. My most limiting factor is watering. I need more irrigation systems set up to get through our long hot summers. i have the table, plants, soil, driftwood, and doctor orders to stay off my feet. perfect time to make my first fern table. My favorite tip is stepping on the plant root system. Are you sure? I am doing this ASAP. This is wonderful. Thank you so much for the instruction. You are so welcome! Have a wonderful time! What a super idea, must put it on my list of ” things to do”! Indeed you must, Pauline! They are so easy to tuck in wherever there is a spot, or you need some height. And so much fun to make!!! I bought that book after Loree made her fern table earlier this year. 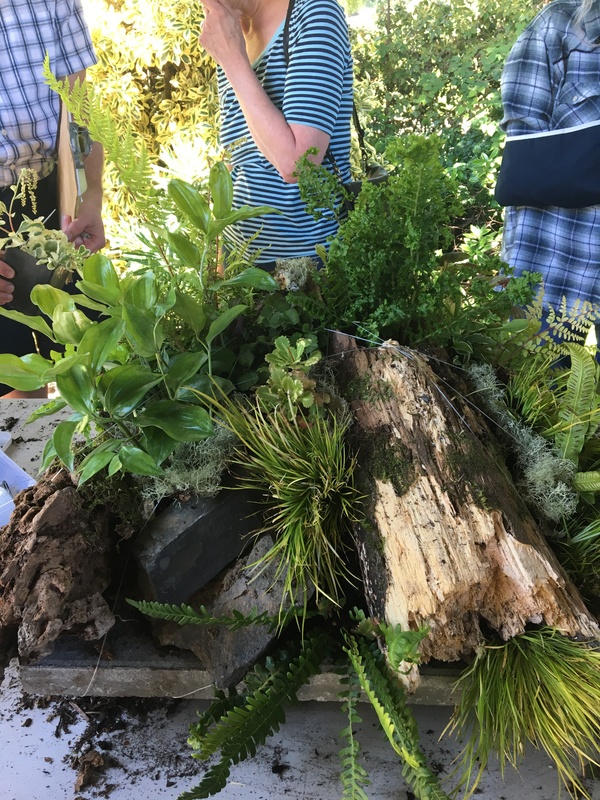 I’ve had a fern table on my to do list for years now, ever since I saw Richie do this same demo at Dig on Vashon Island a few years ago. I’ve been saving up bits of wood and stuff since then. A friend here in Puyallup built one this summer, but raccoons have been tearing it apart, unfortunately, which worries me. I’d really like to make one, but if I do all that work only to have it destroyed by those buggers I swear I’ll have a tantrum. Bravo! Glad you finally got to play in your garden Anna, what a fun project. I did my table in reverse, building it before I went to Richie’s talk (here, if you’re interested: http://www.thedangergarden.com/2017/05/but-i-cant-wait-until-july-building-my.html). Mine held up really well over the hot summer, and I didn’t even have to water it everyday! Funny you should mention this, Amy. My plants are out there sitting beside my large, cement (heavy!) fountain basin waiting for me to build my fern table. I was thinking about going on a hike to collect goodies to give it the foresty look. Your post is the confirmation I needed. Thanks! I can tell how much fun you had! I’m glad you had time to focus on your own space for a change. Ferns and fern tables seem to be out of the question here where the heat and dry conditions shrivel those plants almost overnight (at least between May and November). But, I’m hoping my dream lath house will open new opportunities with ferns and similar shade-lovers. How cool, but daily watering scares me off. Glad you finally got some time to play in your garden! Your fern table looks great. Richie is a fun presenter & Alison and I attended this workshop at DIG several years ago. We’re both still hoarding ferns and rotting wood but hopefully we’ll get going on this project someday soon. That is pretty awesome, though I suspect it’s not appropriate for my dry, dry climate. I will have to ponder what the dry-climate version is of this. The example is just gorgeous. I hope yours grows to be as beautiful. Sounds like you had a really fun time! I bet you could make a really cool one with sedums, euphorbias, grasses and such. 🙂 In fact, I plan on making a semi-dry table as well. It was such a fun project! I have a kinked limb from my apple tree. Hmmmmm. Go for it – you’ll have so much fun! I promise! My stump is now in place, thanks to my son dragging it into our yard. I am excited about doing this. I have taken notes and collected plants. I will share a photo when I am done. If the rain will stop, I will start work tomorrow.